What is the Crespi Man Fund? 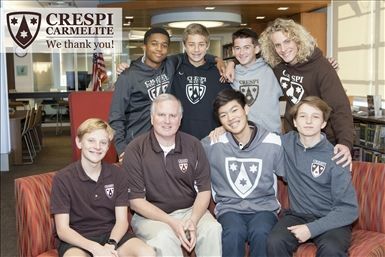 The CMF is the financial heart and soul of our school and helps sustain Crespi’s exceptional programs and activities. The gifts you make on an annual basis benefit every student, every program, everyday and support the operation and mission of the school. More questions? Contact Gregoria Leoni in the Advancement Office at (818) 654-1321. We encourage you to make a four-year pledge to the CMF commensurate with your family's circumstances. All families, including those receiving financial assistance, are asked to make a tax-deductible contribution to the CMF. You can make a one-time, semi-annual or quarterly payment, or add it to your monthly FACTS tuition payment. Our goal is 100% participation.